EXP is an EXPerimental band fronted by Paris Sadonis, who founded the collective in 1992. 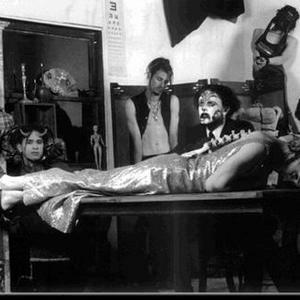 EXP is perhaps the most incestuous band in the Family featuring Rozz Williams, with a wide variety of members, ex-members, collaborators and guest musicians. The entity has one self titled, full length release available through Hollows Hill Recordings. EXP has released singles on 4 different compilations, and also released a limited edition, handmade 7 inch single. EXP - This is a new exciting recording company based out of Detroit Michigan. The company is producing its new self contained production the band intitled "EXP". The Neo-soul, R&B smooth jazz sound is already quickly catching the ear canal of the people like ear candy. People are already saying this is the best music they have ever heard. This recording company called Excellent Production is already like a thief in the night taking the city by storm by producing its'number one act "EXP". History repeats itself again in Detroit like Motown did years ago and you get a chance to witness it again. Earth Wind & Fire guitarist G-Moe is waiting with great anticipation and is highly impressed with the new sound that has taken Detroit. Don't be left out on the outside looking in. You owe yourself this listening experience! Can You Hear Me Now is the title of this new CD.